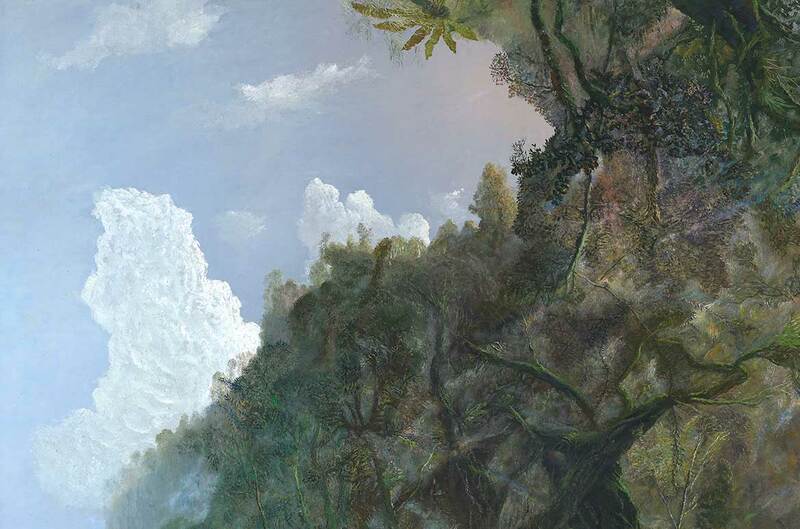 The entrance to the Queensland Art Gallery’s (QAG) new presentation of its Australian art collection is overseen by the sublime landscape Rainforest and mist in afternoon light 2002, by esteemed Queensland painter William Robinson. 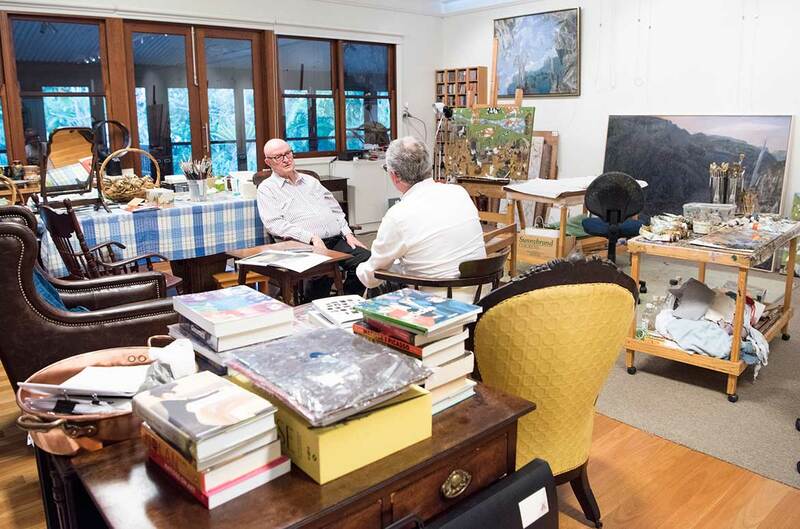 The artist spoke to QAGOMA Director Chris Saines in his home studio in suburban Brisbane. 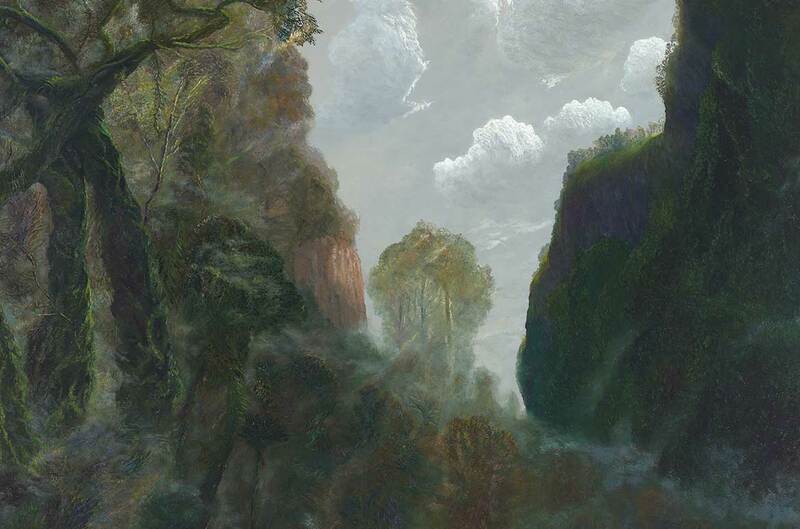 The monumental work Rainforest and mist in afternoon light depicts the Springbrook landscape, part of Queensland’s Gold Coast Hinterland, where William Robinson’s studio was situated at the time. CHRIS SAINES | You’ve painted a number of pictures connected to [the Springbrook National Park] area — you must have walked through it numerous times. Did you take a sketchbook with you or did you just develop a knowledge of the landscape by being in it so regularly? WILLIAM ROBINSON | I did take a sketchbook most of the time, but my sketches were never photographic. I used words, too. They were just sort of descriptive of the day, the feeling. We went up there virtually every morning that we stayed up there. CHRIS SAINES | There is a sense of the seasons, and of the day, in flux. You’ve got the mist in the foreground as the early morning light heats up the landscape, and areas where it looks like it’s later in the day, when the sun’s striking the mossy green edges of the Antarctic beeches. It looks at one point like small raindrops are coming down. I was getting a sense of things you would have seen over a period of time, a cumulative effect rather than a moment. WILLIAM ROBINSON | Definitely, because most of my landscapes developed from ’84 brought in that time sequence, particularly with the ‘Creation’ series.1 And then there were other [works] with time sequences in them, too, and then different viewpoints, even showing things that were, strictly speaking, behind you. So it never had anything to do with setting up an easel and painting. CHRIS SAINES | You’ve used this ‘multiple’ view of the landscape as if you’re moving through it, and as you walk, your gaze shifts — because in the bush you’re constantly looking up, down and around, getting your bearings and maintaining your balance. In the picture, I see one fern in one place and another that looks like it’s on a hill in the distance. And the whole thing strikes me as though they were both folding around and through space. WILLIAM ROBINSON | That’s true, but not like looking into or out of a goldfish bowl. There’s no magnification. It is definitely about things that are above you, probably slightly behind you, too. But the picture does still have to be constructed in a way that has a believable resolution. I have been criticised for not necessarily always having a believable resolution. I did teach perspective at the Central Technical College for quite a few years. I made use of perspective, but wasn’t a slave to it. CHRIS SAINES | It’s organic rather than mathematical. It’s not multiple perspectives or viewpoints all converging in the distance. 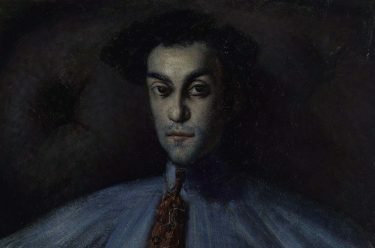 WILLIAM ROBINSON | It’s certainly not like Cubism or Futurism or any of those that have different ideas about movement . . . I often think, well maybe there is a resolution, but I don’t believe that Picasso has the same sort of resolution that Cezanne had. I like a certain amount of resolution . . .
CHRIS SAINES | There are elements along the edge of the painting that seem to be pulled through the painting and folded back up again. It’s a feature of the hills in the lower right of the painting. WILLIAM ROBINSON | Well, that space [on the right side of the painting] (illustrated) is the space of the Numinbah Valley. On the western side of Springbrook we come up a rather bushy gum track until we reach the ridge at the top. Some people can’t drive that drive very easily. They get vertigo. I’ve tried to have the swing of the space of the air above the Numinbah Valley. CHRIS SAINES | The sublime landscape of the baroque feeds into this picture. Thinking of the work of artists like Jacob van Ruisdael and Meindert Hobbema, there were paintings in which the sky has much more volatility or shift in it than this one. This picture feels more anchored, like you’re really in the ground at a very low angle or viewpoint, and then the sky acts as a foil in the background. WILLIAM ROBINSON | Up to a point. The cumulus cloud on the left (illustrated) is a solid object trying to get through a cliff. But as it goes through, it becomes transparent, and that’s part of that landscape down there, where the clouds are low and they can be below you. You mention the baroque period and it does fit in very well with baroque music, doesn’t it? The fugue working from various voices [and] upside down inversions. And Bach’s fugues have these voices which sometimes the subject starts up, and then later on it may be inverted or registering again at another level all the time. CHRIS SAINES | It’s a landscape that evokes more than the sum of its ecological parts, one in which you lose your imagination, and are forced to dwell on thoughts other than just the material form in front of you. This seems to me to move into a spiritual realm. The creation story is in this painting, I think, every bit as much as it is in the paintings where you’ve explicitly invoked it. WILLIAM ROBINSON | It is. After all, the Antarctic beech trees are left over from a time when the continents were joined. Gondwanaland. Those particular Antarctic beeches up there are reputed to be a couple of thousand years old. They’re not huge, but they’re twisted. And, of course, in that damp climate, they grow an enormous amount of moss. You’re looking at something which is older than something like [France’s] Chartres Cathedral. When we first saw Chartres Cathedral, it had little trees growing out of it on the outside. It was just green in colour due to the moss. Inside it was a great heavenly place, but outside it reminded me so very much of an ancient rainforest. And it does evoke questions about creation. CHRIS SAINES | When you’re in that cathedral, it is a bit like being at the bottom of the forest floor and looking up and seeing this shaft of light entering through the building into the eye, and it’s not at all unlike this kind of experience I imagine. WILLIAM ROBINSON | Well, that’s why I suppose, hopefully in a subtle way, I have shown the breakup of white light into the various colours throughout the whole picture. CHRIS SAINES | I was struck by the consistency of the light that’s passing across the landscape. It’s all coming from the one position. So there is a single sun. WILLIAM ROBINSON | Certainly with this picture, yes. With other pictures I may have moved the sun — if they were very long pictures which brought in time, there may be some movement of the sun, or even some twisting of the earth. CHRIS SAINES | Rainforest and mist in afternoon light is a very big painting. WILLIAM ROBINSON | You’ve got to be prepared to stand up for four or five hours a day straight for weeks on end to do something like this, so a big painting is a major job. I have to be content. 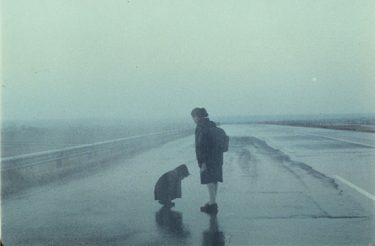 But even with still lives, or any other thing I try, I think: if I can show something which has humanity in it, it will automatically have a degree of spirituality in it. But spirituality is always in the heart of the beholder, not something they can ask me to explain if they can’t see it for themselves. 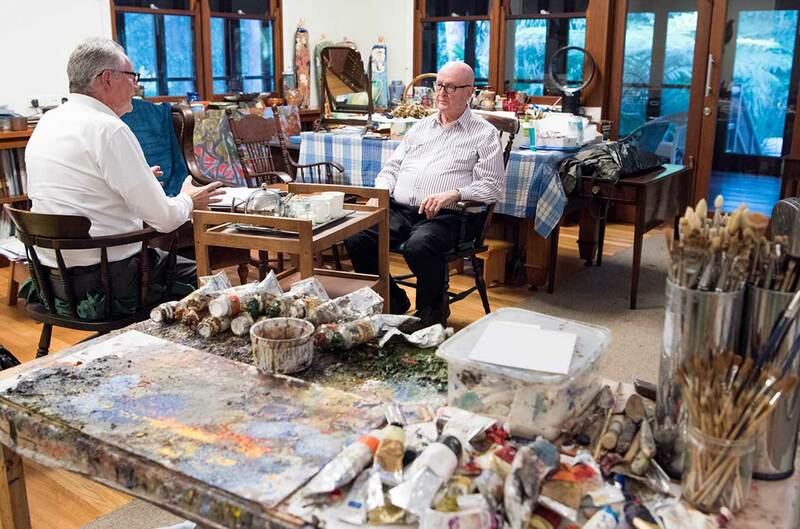 Chris Saines spoke with William Robinson in the artist’s home studio in September 2017. 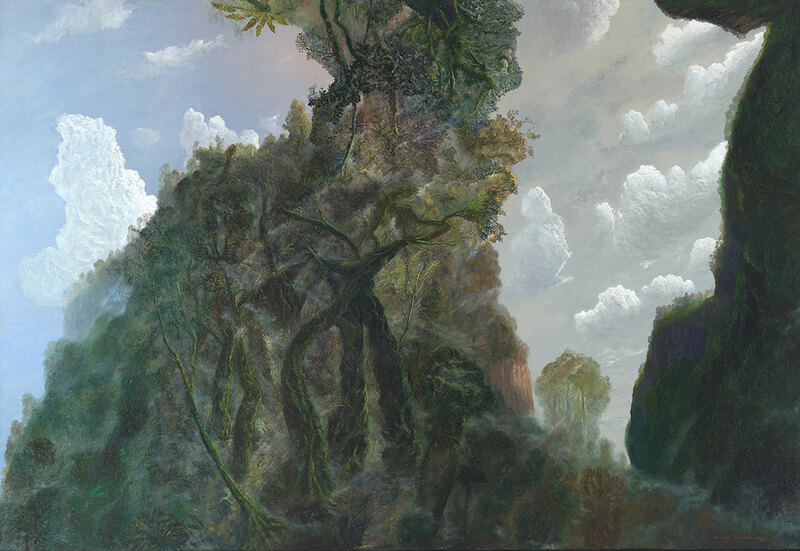 Rainforest and mist in afternoon light 2002 is part of the Australian art display in the Josephine Ulrick and Win Schubert Galleries at QAG. 1 For more on the ‘Creation’ series, see Hannah Fink, ‘Light Years: William Robinson and the Creation Story’, Artlink, December 2001, www.artlink.com.au/articles/2555/light-years-william-robinson-andthe-creation-stor/, accessed 24 October 2017.